Compact, bushy evergreen with ovate, glossy dark green leaves, up to about 10cm long. 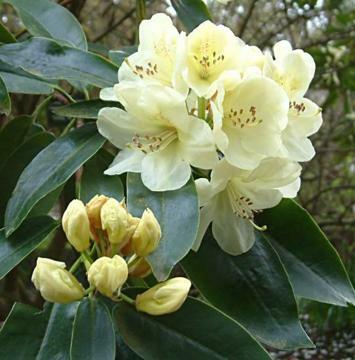 Very attractive, well formed trusses of funnel-shaped, faintly fragrant, pale yellow flowers, slightly pink flushed on the outside and spotted crimson inside, in mid spring. Hybrid of Rh 'Chaste' x R. wardii 'Litiense', raised at Embley Park, Hampshire, in 1945.